Three new mouse lines that scientists expected to model aspects of amyotrophic lateral sclerosis and frontotemporal dementia have no neural problems. They do have enlarged spleens and lymph nodes. Macrophages and microglia were defective and inflammation appeared rampant in the animals, which lacked one or two copies of the murine version of the C9ORF72 gene. Loss of C9ORF72 alone does not lead to neurodegeneration, the researchers concluded. One report suggests the mice model the autoimmune disorder lupus. Hexanucleotide expansions in an intron of the C9ORF72 gene cause ALS or FTD (see Sep 2011 news). Scientists do not know precisely what the C9ORF72 gene product does normally, though its structure suggests it manages membrane events, such as fusions (see Jan 2013 news). Scientists are also working to discover whether the loss of one normal C9ORF72 allele, or the production of toxic RNAs and peptides from the repeat sequence, causes neurodegeneration. Mice lacking the gene in just their nervous systems appear to be fine (see Jun 2015 news; Nov 2013 news). The new papers describe mice lacking C9ORF72 in the entire genome. In the March 18 Science, collaborators from Cedars-Sinai Medical Center in Los Angeles and The Jackson Laboratory (JAX) in Bar Harbor, Maine, describe two of the new mice. Researchers led by Robert Baloh at Cedars-Sinai characterized mice missing exons 2-6 of the C9ORF72 gene. They obtained the mice from the National Institutes of Health’s Knockout Mouse Project, a resource that aims to generate knockouts of every gene in the mouse genome. The KOMP C9ORF72 knockouts were made in a similar way to a separate knockout line lacking exons 2-6, studied by Kevin Eggan of Harvard University, and a previous line characterized by Don Cleveland of the University of California, San Diego, and Clotilde Lagier-Tourenne of Massachusetts General Hospital in Charlestown (see Oct 2015 conference news and table). Because exon 2 contains the start codon for the protein, none of these mice make C9ORF72. In the same Science paper, collaborator Cat Lutz and colleagues at JAX report their line of mice called F12, which lacks 73 base pairs around the gene’s start codon and make no protein either. The Lutz and Baloh mice had similar phenotypes, supporting the idea that the C9ORF72 deletion was behind those changes. Further support comes from a third mouse line, published in the March 16 Scientific Reports, in which senior author Venus Lai and colleagues at Regeneron Pharmaceuticals in Tarrytown, New Jersey, excised the whole gene. Neither group knew that the other was working on the same problem, but all were reassured to discover they had similar results. 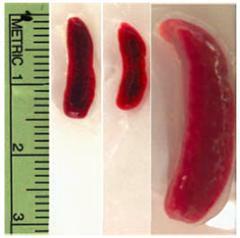 Overall, mice missing C9ORF72 developed normally. They showed no sign of motor neuron disease, balancing on a rotating rod as well as controls. In Science, first author Jacqueline O’Rourke and colleagues report that KOMP mice as old as 17 months had normal numbers of neurons in the brain and spinal cord. Both KOMP and F12 mice lived normal lifespans. The Regeneron full knockouts fared poorly, however, with eight out of 17 animals dying before 60 weeks, when the scientists sacrificed the rest for study. Both the KOMP and Regeneron mice were sickly. In open-field tests, they roamed less than controls, whereas the F12 mice explored normally. It was readily apparent why the mice might not feel like strolling. Their spleens and lymph nodes were huge (see image), filled with large, debris-laden myeloid cells, including macrophages. In this regard, these mice are similar to C9ORF72 nulls reported by the Eggan and Cleveland/Lagier-Tourenne groups, but the new studies offer more detail on the specific role C9ORF72 plays in the immune system. O’Rourke and co-authors focused on the cellular mechanisms behind the altered myeloid cells. She found that the swollen myeloid cells in the KOMP mice contained abnormally high levels of autophagy markers p62 and LC3, indicating defects in trafficking from endosomes to lysosomes. This would create a problem for macrophages gobbling up pathogens and infected cells, and could lead to inflammation, the authors predicted. To study the importance of C9ORF72 in macrophages directly, O’Rourke and co-authors isolated bone marrow stem cells from their C9ORF72-null mice and differentiated them into macrophages. Late endosomes and lysosomes accumulated in these cells, indicating stalled traffic in the autophagy pathway. Transducing the cells with the C9ORF72 gene reversed the lysosome accumulation, confirming the lack of C9ORF72 had created the defect. What about in the brain? In the nervous system, microglia assume macrophage roles, so O’Rourke and colleagues wondered if they, too, were altered in the absence of C9ORF72. In perusing published records of gene expression in the brain, Baloh was surprised to learn that microglia typically express more C9ORF72 than neurons, suggesting they might be particularly sensitive to its loss (Zhang et al., 2014; Sharma et al., 2015; Butovsky et al., 2014). Indeed, just like the macrophages, microglia from the null mice accumulated endosomes and lysosomes. They also produced high levels of the inflammatory cytokines IL-6 and IL-1b. To find additional evidence of inflammation, the authors compared gene expression profiles among spinal cords from 17-month-old C9ORF72-null and control mice. Of 19 pathways upregulated in the null mice, nearly one-third had to do with inflammation. Despite these changes, the brains of all C9ORF72-null animals appeared normal. Does the microglial/inflammatory phenotype correspond to any feature of ALS? To find out, O’Rourke and colleagues cross-referenced the mouse microglial expression profiles with gene expression data from people with sporadic or C9ORF72-based ALS (see Jul 2015 news). Of the six pro-inflammatory pathways upregulated in the C9ORF72-null mice, five were also upregulated in the brains of C9ORF72 expansion carriers, whereas only one was upregulated in sporadic ALS cases. Microglia in the motor cortices and spinal cord tissues from three people who died of C9ORF72-based ALS were also full of lysosomes. “It is a very convincing argument that C9ORF72 is an essential gene to cells of myeloid origin,” commented Christine Vande Velde of the University of Montréal, who did not participate in the work. “It may be that there is a differential effect of the C9ORF72 expansion in the microglia cells compared to the neuronal cells.” The neurons seem to suffer from the repetitive RNAs and peptides produced by the expansion, she and Baloh agreed. “C9ORF72 loss of function would not be expected to produce neural toxicity in isolation, but might by working synergistically with other mechanisms,” commented Johnathan Cooper-Knock of the University of Sheffield in the United Kingdom, who was not involved in either paper. For example, O’Rourke and colleagues suggest defective microglia might fail to clear aggregates from the nervous system and that could eventually cause trouble for neurons. However, Cooper-Knock was not ready to blame all the inflammation in the mice on problems in the myeloid cell lineage alone. To prove that would require a demonstration that mice with C9ORF72 missing only from myeloid cells have the same illness. Baloh plans to create models that lack C9ORF72 specifically in microglia. He also intends to cross the null mice with a line overexpressing expanded C9ORF72 to determine if mice carrying the mutant allele but no normal C9ORF72 get sicker than the parent strains (see Dec 2015 news). At Regeneron, Lai and first author Amanda Atanasio called in co-author Vilma Decman and other colleagues versed in immunology to help them understand the C9ORF72-null phenotype. The mice possessed more circulating immune cells, including neutrophils, monocytes, and eosinophils, than controls did, and their blood concentration of certain cytokines and chemokines was higher. RNA sequencing found expression differences in immune response and inflammation genes. These features all point toward systemic inflammation and likely explain why the mice were sluggish during open-field tests, commented co-author Susannah Brydges. “If you or I had such massive expansion of immune cells and circulating cytokines—we would be feeling sick and be in bed,” she said. Decman and colleagues found a proliferation of antibody-producing plasma cells in the spleens and lymph nodes of the null mice. IgM and IgG antibody classes were elevated in the serum. Proliferating plasma cells are often associated with autoimmunity, and sure enough, the C9ORF72-null mouse serum contained autoantibodies against the core proteins, called Smiths, of small ribonuclear proteins. These kinds of antibodies would make the mice ill, commented Brydges. Those anti-Smith antibodies suggested the mice might mimic systemic lupus erythematosus. In people, this autoimmune disease attacks a variety of tissues, including the skin and joints. Symptoms include joint pain and swelling, hair loss, fever, and sensitivity to sunlight. A majority of people who possess anti-Smith antibodies come down with lupus, said Brydges. Supporting the hypothesis, the C9-null mice also sustained kidney damage, a common problem in people with lupus. The Regeneron scientists are now searching for C9ORF72 mutations or expansions in people diagnosed with this autoimmune disease. People with ALS are not known to have systemic immune abnormalities, Baloh said—but then, physicians have not had reason to check. Both he and Atanasio suggested doctors might want to take an infection history and assess immune symptoms more closely in ALS patients. The literature contains at least one other hint of a relationship between C9ORF72 and autoimmunity. Cooper-Knock and colleagues reported that in those rare, unfortunate instances where ALS and the autoimmune disorder multiple sclerosis coincide, patients are likely to carry C9ORF72 expansions (Ismail et al., 2013). “These papers are important because they shed light on the normal role of C9ORF72 in lysosomal function, cytokine-mediated inflammation, and immune response,” commented Ronald Klein of the Louisiana State University Health Sciences Center in Shreveport, who did not participate in either project. Both papers suggest that while immune function requires C9ORF72, its loss creates no ALS phenotype, Vande Velde said. Neither group analyzed FTD-like phenotypes in detail, so the exact relationship between C9ORF72 loss of function and frontotemporal lobe degeneration remains uncertain, she added. To O’Rourke, the mice raise a red flag for scientists aiming to quell ALS with antisense oligonucleotides (ASOs) against C9ORF72 (Oct 2013 news; Jan 2013 conference news). The body’s macrophages and microglia need some C9ORF72 to function properly, so it might be wise to dampen only the expanded allele. 1. O’Rourke JG, Bogdanik L, Yáñez A, Lall D, Wolf AJ, Muhammad AK, Ho R, Carmona S, Vit JP, Zarrow J, Kim KJ, Bell S, Harms MB, Miller TM, Dangler CA, Underhill DM, Goodridge HS, Lutz CM, Baloh RH. C9orf72 is required for proper macrophage and microglial function in mice. Science. 2016 Mar 18;351(6279):1324-9. [PubMed]. 2. Atanasio A, Decman V, White D, Ramos M, Ikiz B, Lee HC, Siao CJ, Brydges S, LaRosa E, Bai Y, Fury W, Burfeind P, Zamfirova R, Warshaw G, Orengo J, Oyejide A, Fralish M, Auerbach W, Poueymirou W, Freudenberg J, Gong G, Zambrowicz B, Valenzuela D, Yancopoulos G, Murphy A, Thurston G, Lai KM. C9orf72 ablation causes immune dysregulation characterized by leukocyte expansion, autoantibody production, and glomerulonephropathy in mice. Sci Rep. 2016 Mar 16;6:23204. [Pubmed].